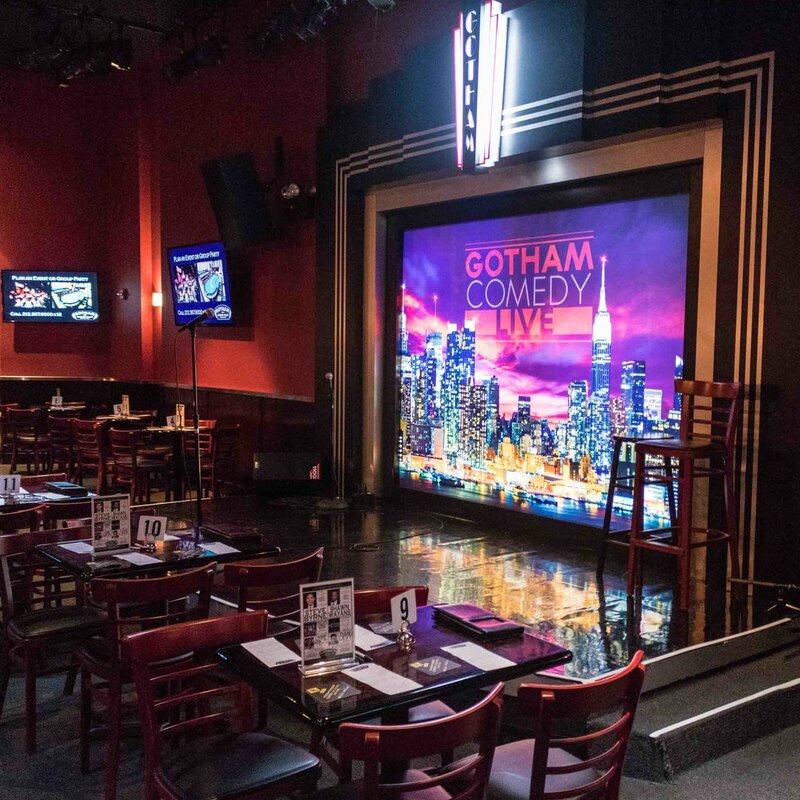 Book a spot on our New Talent Shows at the world-famous Gotham Comedy Club 300-seat main stage. A strong DVD can help a new comic secure managers, agents, and auditions, and book paid work! Many agents and managers camp out at clubs to scout new comics, and clubs often use New Talent Shows as unofficial audition nights. Most open mic crowds are small and unresponsive, resulting in a lackluster show. New Talent Shows are produced on Gotham’s Main Stage in front of an enthusiastic crowd! Our New Talent shows are frequented by the likes of Jerry Seinfeld, Jay Leno, Amy Schumer, and Jim Gaffigan! I have been participating in Andy's New Talent shows for over 10 years now, first as a bringer and now as a guest. What keeps bringing me back are the enthusiastic audiences and quality of shows. Andy is the best at this stuff. Andy Engel's New Talent shows are in a class by themselves. I have never made a better quality tape to submit for jobs and that's counting NBC's Last Comic Standing finale! Over the years I have been fortunate enough to do Andy Engel's New Talent shows and I have been seen by agents, managers, comedy festivals and casting directors under the best of circumstances, which means a full house and a hot crowd. Probably my best story was getting cast in a Broadway show when the casting director was there to see someone else! Steve Byrne, Creator, Star, Writer of "Sullivan & Son", Writer/Director upcoming Feature Film "The Opening Act", Director of the upcoming documentary "Always Amazing"
I was working as a host at Caroline's Comedy Club, many years ago, never intending to attempt stand up and Andy Engel's New Talent Showcase inspired me to take a crack at it. He cultivated a show that gave people of all ages and backgrounds to explore their passion and voice on stage. Twenty one years later, 4 hour stand up specials, 3 seasons of my own television show, 2 upcoming films and 1 dependency on whiskey are all thanks to Andy allowing a scrawny kid from Pittsburgh up on stage to see if he's got what it takes. I guess I owe Andy a note of gratitude? Thanks so damn much Andy. "If you're serious about your comedy career then you need to do Andy Engel's New Talent Show. The DVD you get will jumpstart your career in a powerful way." Andy Engel's New Talent show was responsible for my career taking off. My first development deal came from a tape that was made at one of his shows. The shows are filled with an appreciative audience that encourages you to do your best. A recorded copy from those shows will always kill! If you are a comedian, your tape is everything, it’s your calling card, your sales pitch and your #1 marketing tool. Countless comics have gotten their killer tape at an Andy Engel Showcase. Andy Engel's New Talent shows are undeniably the best of their kind! The room is frequently packed with extremely receptive crowds, enabling new comics as well as seasoned professionals an opportunity to be involved in what is consistently one of the best shows in New York. And NOTHING beats the quality of the DVDs comics can make at these shows, which can be used for anything from finding an agent to procuring a high-profile booking. It's Andy Engel's attention and professionalism that make these shows work week in and week out. Andy is truly a blessing to the New York comedy scene. I've been performing on Andy's New Talent shows for years. Back when I was really 'new,' I looked at it as a high-quality show I could invite industry to. Now, as a pro, I still love to do it. Andy always mixes new talent with pros, so the audience is guaranteed a good show. My experience with Andy Engel is that he creates the optimal showcase environment for making a DVD. This is not easily done. Putting a DVD together is critical to communicating what you have to offer, and there's no better place in my experience to do it. “I simply wouldn't have gotten my first TV credit, AXS TV, without the help of Andy Engel and the platform his New Talent show provided me." I've known Andy since I've started and many of the biggest career opportunities I've had were through him and his shows, from live touring dates to TV shows like AXS.TV's 'Gotham Comedy Live.' I definitely owe him a lot and am forever grateful. Every comedian - active and aspiring - wants to know: how can you get your material heard in the extraordinarily crowded New York City comedy scene? The answer: Andy Engel's New Talent Shows. Andy provides a sharp, professional environment where you can create a great recording of your material with a lively and engaged crowd. I’ve been doing Andy’s New Talent showcases for years. My very first one I did with Andy was almost two decades ago when I first started out. I traveled all the way down from Boston. The tape gave me a boost in my career that I could never had imagine. Since then, Andy has continued to produce great audience, amazing venues, and beautiful looking tapes that will benefit you for years to come! Been working with Andy Engel for over 2 years now and all I can say is this. I'd attend his New Talent showcases & would watch on and perform on them as they'd push me further as a stand up. Not many people gave me shots at club spots, but Andy did and he saw how committed I was to making my comedy stand out in NYC & he's consistently been able make that happen. When I first started comedy, Andy Engel's new talent showcases were some of the first real shows I did. Getting the experience in front of a real packed crowd taught me a lot and also helped me overcome my fear of doing stand up. Andy and his showcase was one of my first impressions into the stand up world and here I am 8 years later on the road opening up for Adam Sandler and David Spade, and been a producer on Sandler's last 5 Netflix movies and getting and also getting to act in them. Andy's showcases gave me confidence early on and taught me a lot. After moving back to New York in 2014 in search for more comedic opportunity I was lost in finding a home room to perform in. Fortunately I was able to stumble across Andy Engels New Talent Showcase which is far from a novice showcase with comedic talent from all levels even celebrity pop ups. Since my arrival to New York, Gotham Comedy club has done wonders for my career, providing me with 2 T.V appearance and a T.V show pilot in development. I only have positive things to say about Andy and his new talent showcase, I am his black adopted step child and I am thankful for the platform that he provides me and other comics it is not one to be taken for granted. Love yah!! I had been working mics/privatley produced shows for a couple of years before I met Andy Engel, and once I did it was a stepping stone to a better career. I went from doing bar shows to four people in the village to being thrusted into a an electric crowd sandwiched in between the likes on Gaffigan and Seinfeld...yes, on a NEW TALENT show. That's because Andy takes the time to get to know his comics and push them to be the best and throw them into environments that will make them as sharp as a knife. His new talent shows and Manhattan Comedy School courses will make you a better comic and his frienship will make you a better person. Thank you Andy for all of my success! Andy Engel produces a high quality show because he's experienced. He has worked with a lot of the best comedians in the business. These New Talent shows are a great place to have people you respect come out to see you. It is a bad place though, to invite people who dislike you or have some kind of issue with you. Those people are best ignored. The hardest part of comedy is creating jokes and building a set. The 2nd hardest part is capturing it on tape. When I moved to New York I had material, but I couldn't prove it until I did Andy Engel's New Talent Showcase and made a great tape. A professional setting with a supportive audience is hard to find, but that's what Andy consistently delivers.